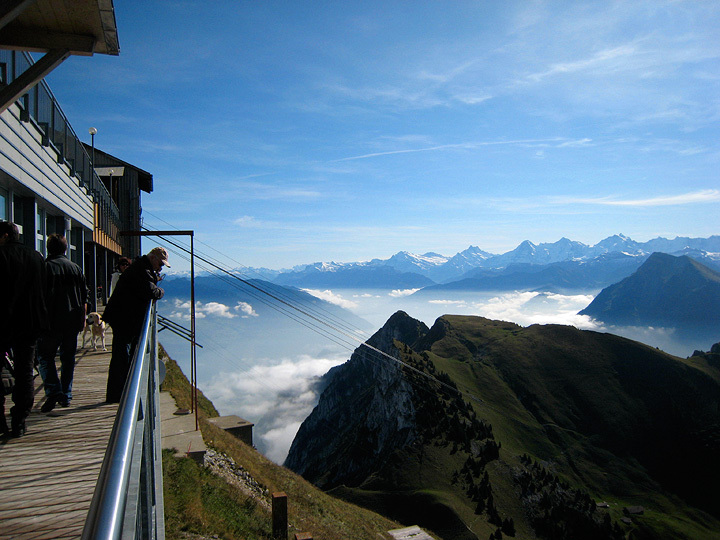 Mark Conner and Peter Harris came back for another September get-away with Kathy in Switzerland this year. 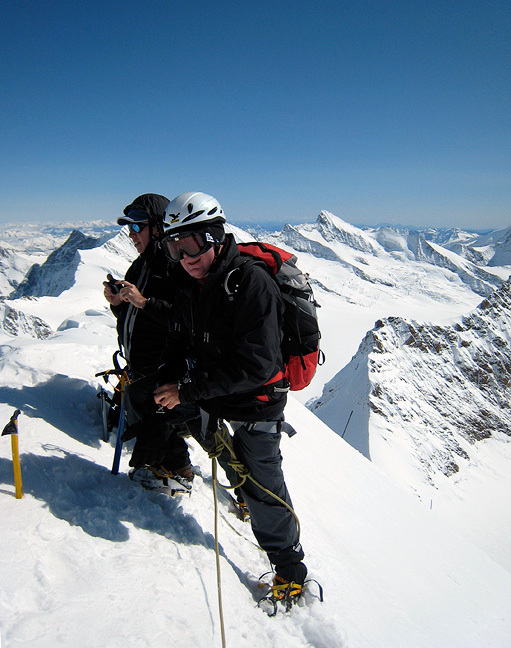 We met up in Grindelwald for an ascent of the Mönch. 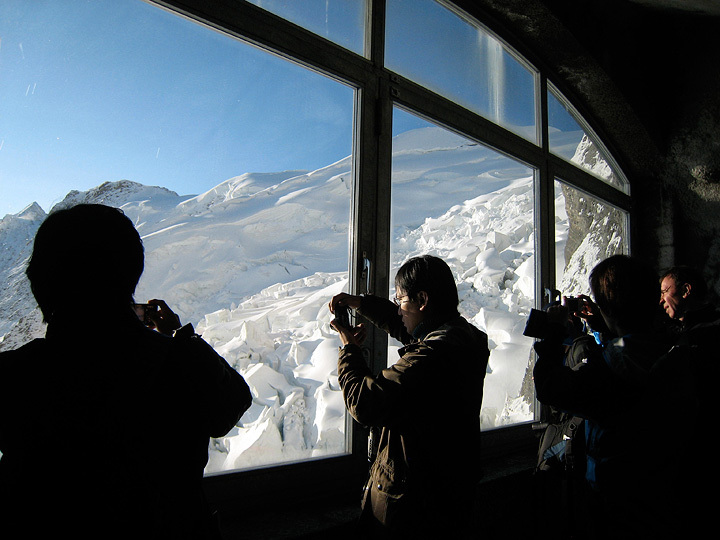 Discouraging fog dropped away below us as we rode the Jungfraujoch train up through the bowels of the Eiger. 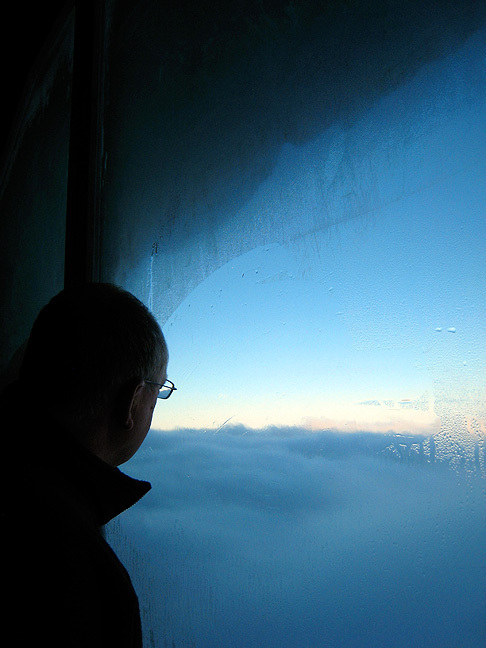 Peter looks out at the sea of clouds from the Eiger Nordwand windows. Higher still, at the Eismeer station, the day promises to be exceptionally fine. 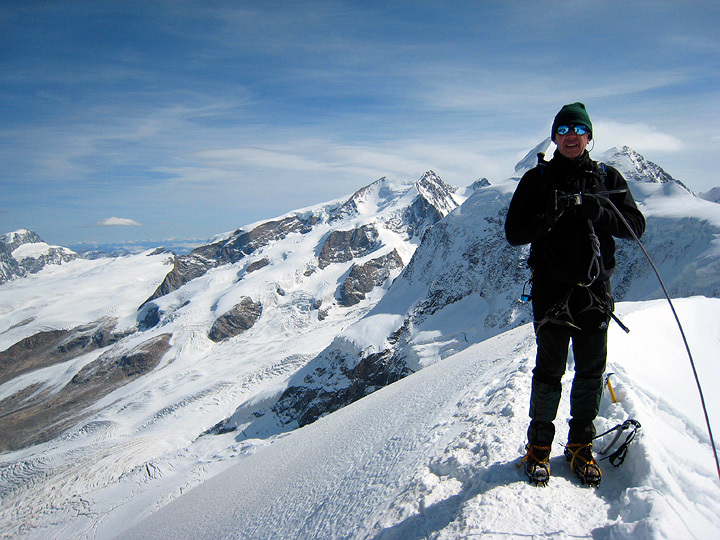 Mark enjoys a brief pause for a photo opportunity on the Mönch's Southeast Ridge. Conditions were very snowy, making for a bit more than the usual effort, and some avalanche potential if you left the ridge crest. 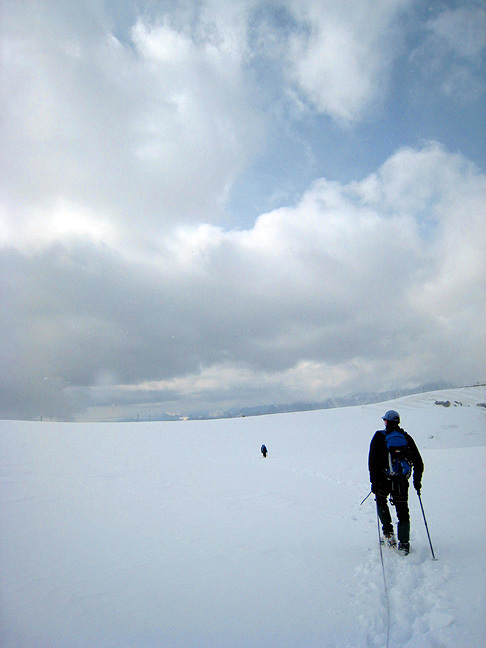 Climbing as quickly as we could given the deep snow, our rapid ascent to a high elevation began to make itself felt. 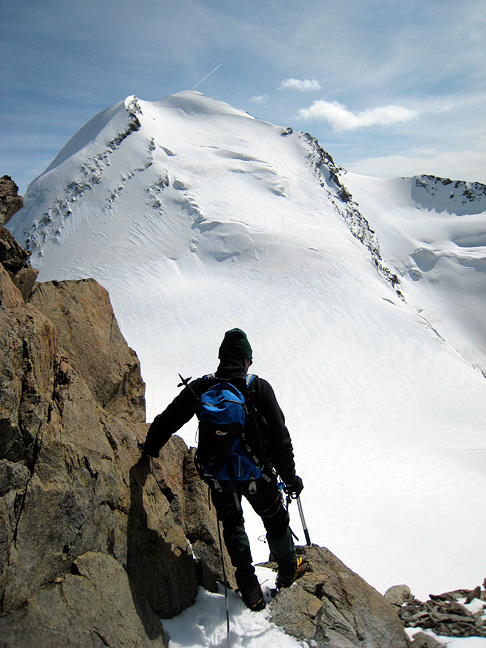 We paused again for "summit" photos, at our high point on the summit ridge. 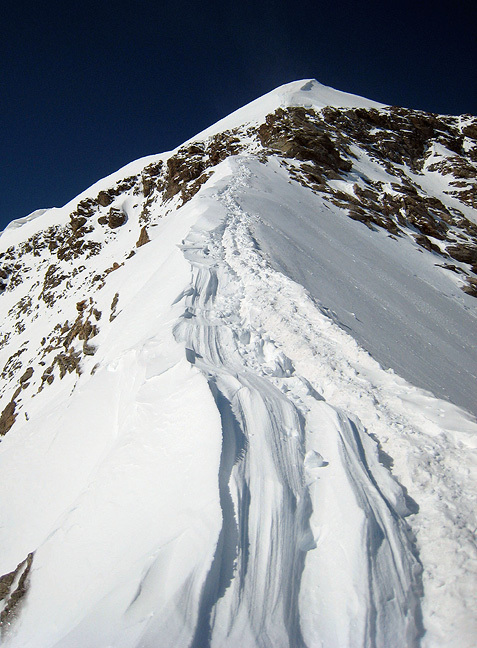 The long traverse to the top from here necessitates traveling on the steep flank just off the crest of the very corniced ridge, which in these conditions was too exposed to a slab taking off down the south face. 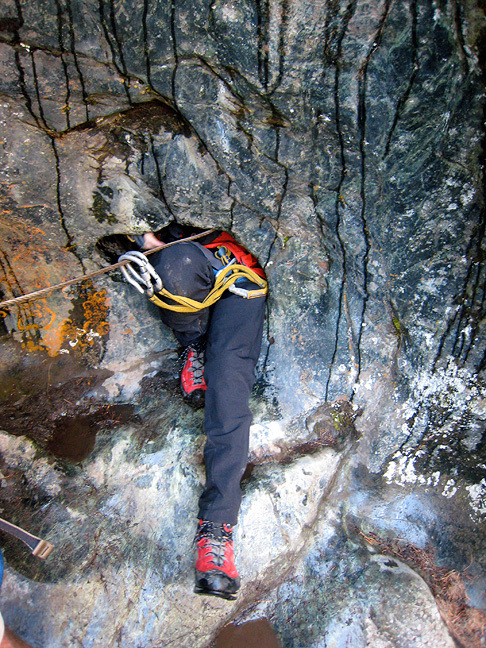 We did not have the time to secure this section as it would have required, so we called it good and returned to town. It was a good effort on a beautiful day, with very little company on this otherwise popular route! 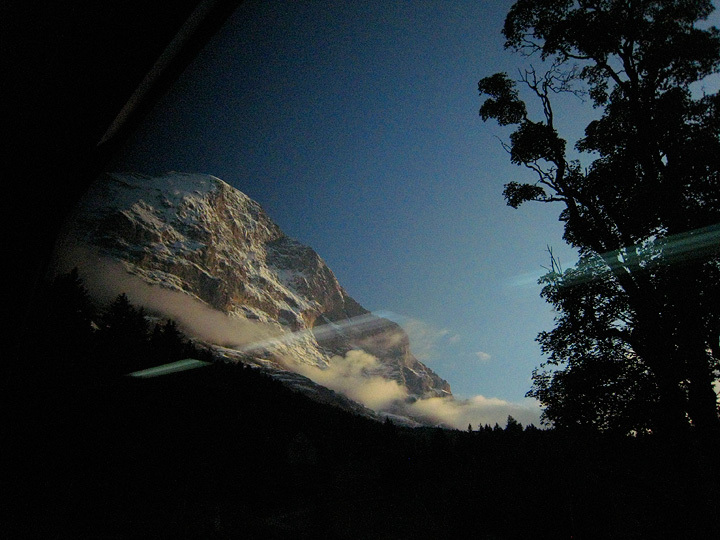 Returning to Grindelwald in the evening we had haunting views of the snowy Eiger Nordwand from the train window. 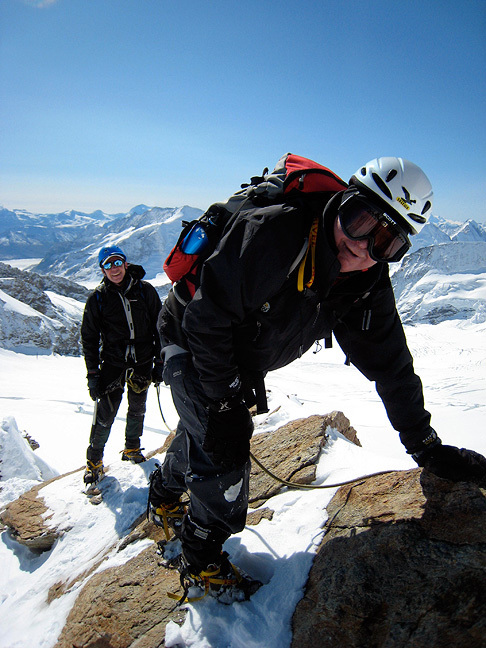 Peter had to return home, but Mark and Kathy headed toward Zermatt, taking in some rock climbing along the way at the Stockhorn. Another beautiful, if chilly day. 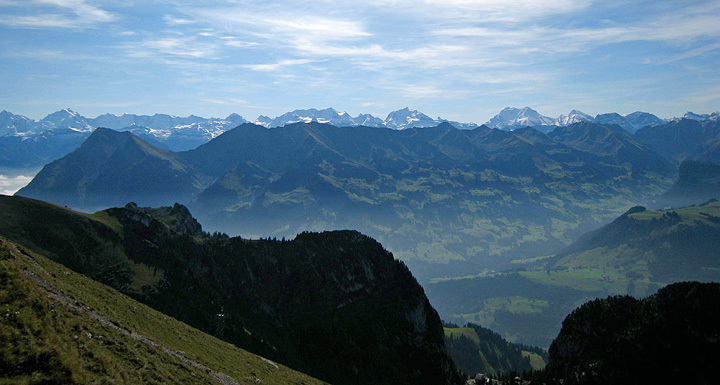 Looking southward toward the Blumlisalp group. 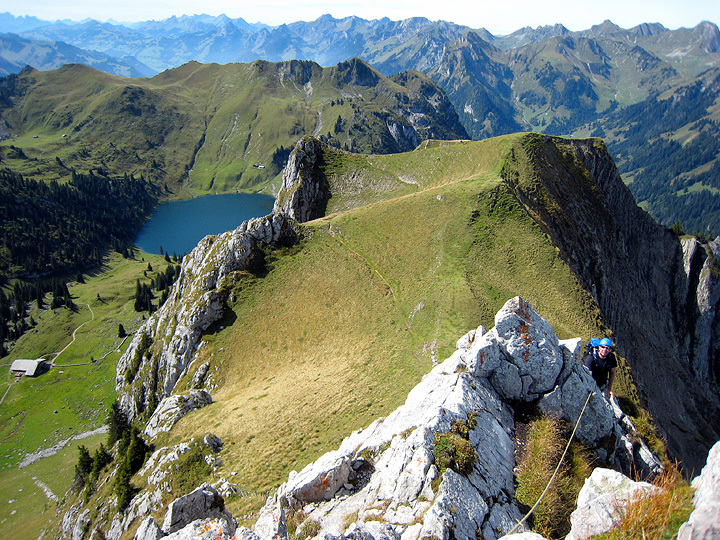 After a few warm-up pitches on one of the many crags in this high basin, we climbed a scenic ridge traverse to the top of the cable car. 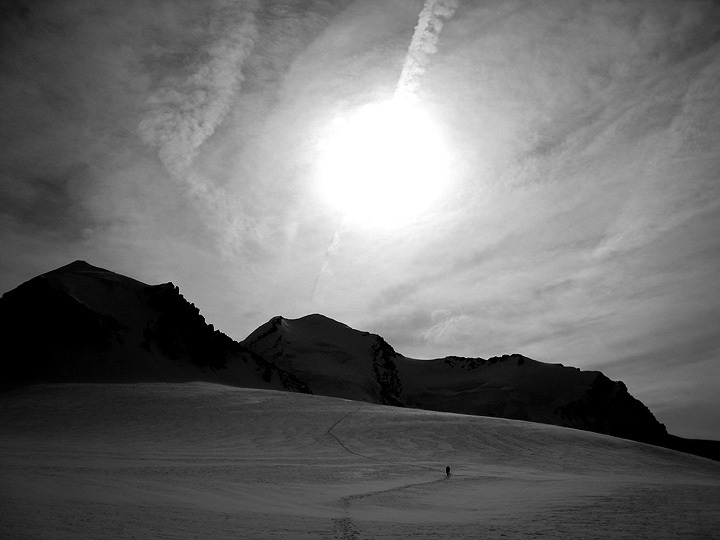 Next on our agenda was a climb of Pollux, between Zermatt and Cervinia. High clouds announce a change in the weather. 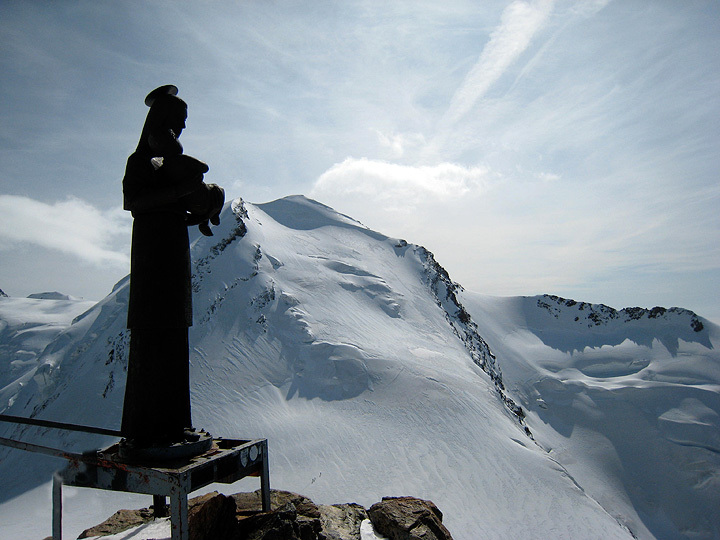 But for now all is beautiful as we approach the summit. Castor in the background. 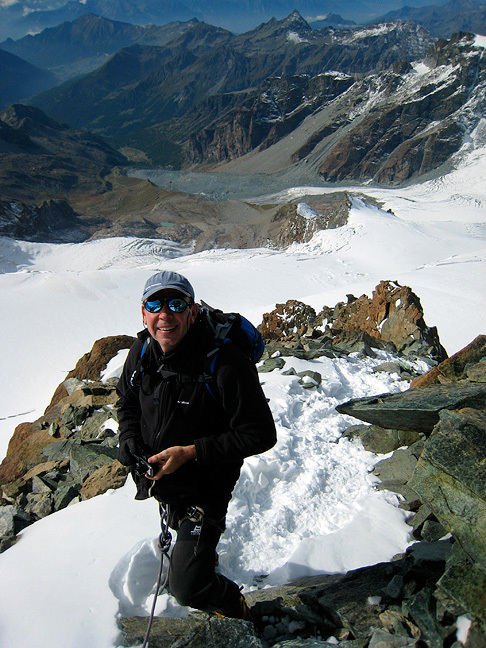 Mark enjoys some more photo opportunties from the top, with Lyskamm and Monte Rosa in the background. And returning to the lift station as the storm clouds gather. 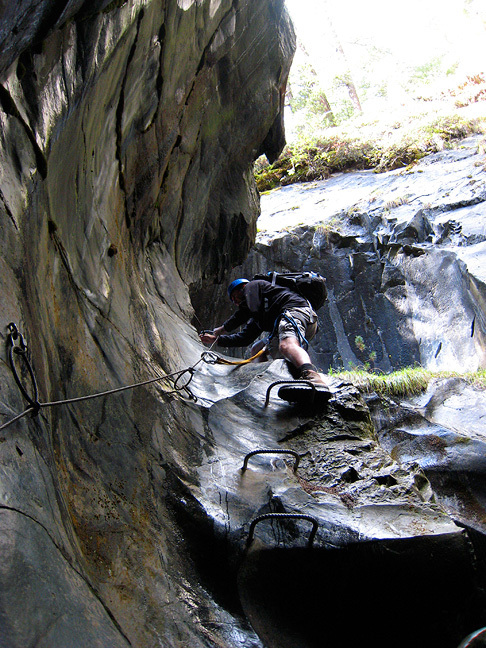 On our last day the rain came, so we enjoyed our favorite rainy-day activity in Zermatt, the Gorner Gorge fun-ride! Here in a tight squeeze before another zip-line traverse, we all get muddy and wet. The water-carved slabs are always slippery, but especially so in the rain! It appears the season is over, but we hope to see Mark and Peter again in '09.